Product #16615 | SKU SP+PMRH | 0.0 (no ratings yet) Thanks for your rating! 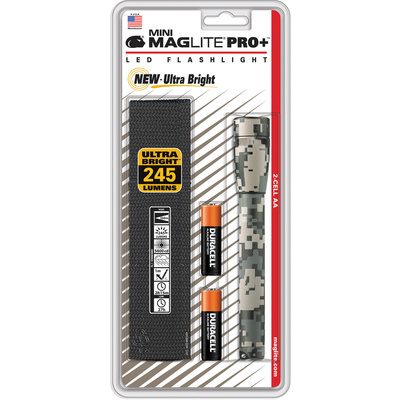 The UCP camo Mini Maglite Pro+ 2AA LED Flashlight from Maglite features the iconic Mini-Mag design paired with a 245 lumen maximum dual-output LED emitter. Twist the head to activate the high output. Twist off, then back on within half a second for the 35 lumen low output. Simply turn the head to focus the beam from a tight spot to a wide flood light. Its aluminum alloy body has a scratch and corrosion-resistant UCP camo finish and is o-ring sealed for water resistance. The Mini Maglite Pro+ comes in clamshell packaging with a black full-front-flap nylon holster and a pair of AA batteries.